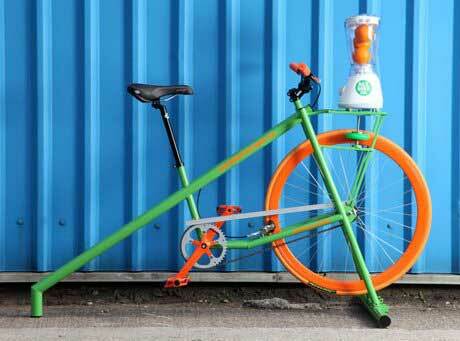 Hire a Smoothie Making Bike for some environmentally friendly, pedal powered smoothie making fun! How do you make a fruit smoothie even more healthy? Simple, forget the electric and use pedal power to make it! The customer chooses the ingredients to their own taste, places them into the blender, climbs on to the bike and pedals for a short period. The front wheel of the smoothie bike drives the blender mechanism and after a short period of pedalling you have a tasty smoothie. Healthy food, healthy exercise, environmentally friendly, lots of fun, and a delicious smoothie to drink at the end of it! 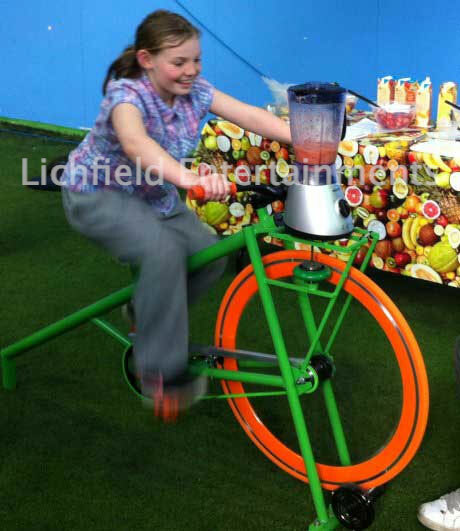 The Smoothie Maker Bike can be hired as just the bike with you supplying your own consumables or be supplied with everything you need to make and serve fruit smoothies - a great range of fresh fruit, fruit juices, and serving cups. 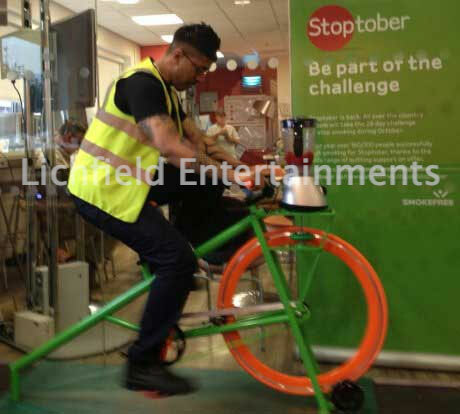 'Rolls Royce Plc, recently hired Lichfield Entertainments Smoothie Bike, for an internal leadership event. Their service was fantastic. We didnt need to do anything and they provided an excellent selection of fruit. Definitely recommend!' Hannah. We offer our Smoothie Bike hire in the Midlands and throughout the UK including Birmingham and the Midlands, Buckinghamshire, Cheshire, Derbyshire, Gloucestershire, Herefordshire, Hertfordshire, Leicestershire, Manchester, London, Northants, Nottinghamshire, Oxfordshire, Shropshire, Staffordshire, Warwickshire, Worcestershire, Yorkshire. If your area isn't listed just ask!